Apple Rice Krispies Cookies are just a fun excuse for a treat during the Fall. We’re counting down to back to school! 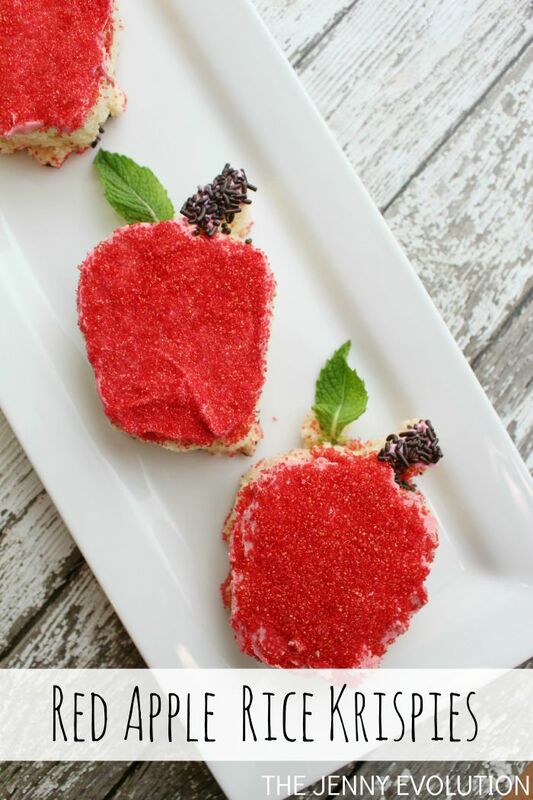 Why not get the kids in the Fall/Autumn mindset with these fun back to school red apple Rice Krispie treats. And don’t forget about teacher! These would be an awesome addition to a teacher appreciation gift. This recipe will yield a 9 x 13 pan (approximately 6 apples). This post contails affiliate links. Line a 9x13 pan with foil and spray with Pam. Set aside. Once the marshmallows are melted, remove from heat and stir in the cereal and salt until well-coated. Using a rubber spatula (spray with Pam ), transfer the cereal mixture to prepared pan and press down firmly and evenly. Once cooled, cut out 6 apple shapes with an apple cookie cutter. 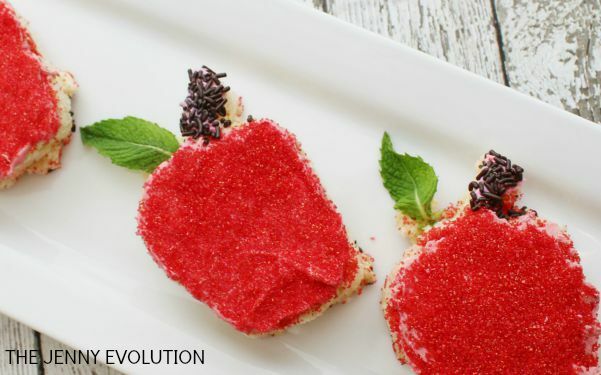 Apply a thin layer of ready to spread frosting on each apple shape. Sprinkle red sprinkles on the apple. Sprinkle brown sprinkles on the stem. Add a mint leaf by pressing firmly into the apple (the marshmallow helps it stick). Optional: add cookie pop sticks to make red apple Rice Krispie pops. This recipe will yield a 9 x 13 pan (approximately 6 apples). This look so fun and I’m sure they are a big hit with children. Thanks for sharing on Snickerdoodle Sunday! Add sprinkles to anything and my kids are game…sprinkles to rice krispies treats is genius! Thanks for sharing with Small Victories Sunday Linkup. Pinning to our linkup board and hope you found some great posts to visit this week! Thanks…. the kids were thrilled! These are adorable & I bet yummy! Thanks for sharing at the Inspiration Spotlight party. Shared. How cute! Thank you for sharing on Merry Monday! Hope to see ya next week! These are cute for an after school snack idea! #pinjunkieparty! These are so cute! They’d make a great after school snack! These apples are so cute!! I wish I had of seen them before our letter A week (two weeks ago). Maybe we can still find an excuse to make them. This looks like a simple bts treat that I can make. Thanks for sharing on Merry Monday. This will be one of my features this week. These are very special treats! Hope you are having a great day and thanks so much for sharing with Full Plate Thursday.